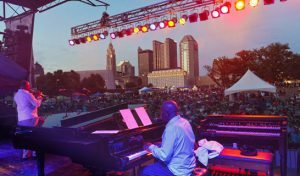 The wait is almost over for another year – the 38th annual Columbus Jazz and Rib Festival is this weekend! This year’s event returns to the Scioto Mile and offers 45 live performances on three stages in Bicentennial, West Bank and Genoa Parks. These three days of award-winning ribs from 23 barbecue teams, a wide range of family activities, and a mix of area talent and world-renowned jazz artists takes place on Friday, July 21st (11am – 11pm), Saturday, July 22nd (11am – 11pm), and Sunday, July 23rd (11am – 8:30pm). This year’s schedule features renowned headliners on all three stages including: Kenny Garrett Quintet; Jazz Funk Soul featuring Jeff Lorber, Everette Harp & Paul Jackson Jr.; Jonathan Butler & Gerald Albright; Rebirth Brass Band; Karl Denson’s Tiny Universe; Papo Vazquez Mighty Pirates Troubadours; Miles Electric Band; Big Bad Voodoo Daddy; and Maysa. The lineup also showcases Columbus stars like Urban Jazz Coalition, fo/mo/deep, Pete Mills Quartet, Mark Lomax Trio, FLIPPO and James Gaiters’ Watu Utongo among many others. A complete schedule of live jazz performances for the weekend follows, along with bios of the headliners provided by the festival. Kenny Garrett Quintet: With a career spanning over 30 years, Kenny Garrett is a force of nature in the jazz community. As a bandleader for two decades, Garrett has grown as both a saxophonist and composer, continuously finding new ways to communicate his musical vision. Garrett’s melodies and powerful approach to rhythm and meter are key elements to his intricate compositions and improvisations. Jazz Funk Soul ft. Jeff Lorber, Everette Harp & Paul Jackson Jr.: Jazz Funk Soul, iconic for their smooth jazz, featuring Jeff Lorber, Everette Harp & Paul Jackson Jr., are musicians with a wealth of experience. Lorber’s achievements include multiple Grammy awards based on his hypnotic piano performances. Everette Harp’s gospel and soul sounds paired with dynamic funk edges and urban textures catapulted the saxophonist’s career as a musician. Pulling together this jazz trifecta, Paul Jackson Jr.’s unique background in R&B, soul and pop create an invigorating sound that shouldn’t be missed. Rebirth Brass Band: This true New Orleans institution formed by the Frazier brothers combine an upholding traditional brass band sound with funk and hip-hop to create their signature sound. Although their music is precise in nature, their vivacious sound cuts loose with their ever-present sense of freedom and passion for performance. Rebirth Brass Band is the undisputed leader of the New Orleans brass bands. Karl Denson’s Tiny Universe: Known across the world as THE saxophonist, Karl Denson has performed everywhere from South America to New Zealand. Denson’s wide range of musical style, spanning from collaborations with Slightly Stoopid to the Blind Boys of Alabama, make his sound distinct, supercharged and dynamic. Don’t miss a captivating performance by one of the world’s leading saxophonists. Big Bad Voodoo Daddy: Named after an autograph by blues legend Albert Collins, Big Bad Voodoo Daddy continues to celebrate and revitalize jazz and swing music with a fresh, even brazen, twist. From performing with some of the country’s finest symphony orchestras to playing live at Superbowl XXXIII, Big Bad Voodoo Daddy’s bold and fearless sound will leave an audience begging for more. Papo Vazquez Mighty Pirates Troubadours: Celebrated trombonist, composer and arranger Papo Vazquez fuses Afro Caribbean rhythms with the freer elements of progressive jazz to create a spicy and energetic tone. Papo Vazquez and the Mighty Pirates Troubadours experiment and innovate traditional “bomba jazz” into something that has won the band multiple Grammy Awards and left audiences awestruck across the world. Maysa: Natural performer Maysa Leak has instantly identifiable vocals that embrace both R&B and Jazz. With a transfixing voice and unstoppable stage presence, Maysa has captured audiences with artists as big as Stevie Wonder. This Grammy-nominated performer’s career spans over 25 years and shows no sign of slowing down. With a mission to captivate an audience with her passion on stage, Maysa is a magnetic and truly unique presence. Miles Electric Band: The Miles Electric Band is an ensemble of world-class talents featuring performances from a unique roster of players. Their sound revisits the repertoire from Miles Davis’ electric period as a framework for modern jazz innovation. With several Grammy Award winning and world class musicians in the mix, this is a band you don’t want to miss!